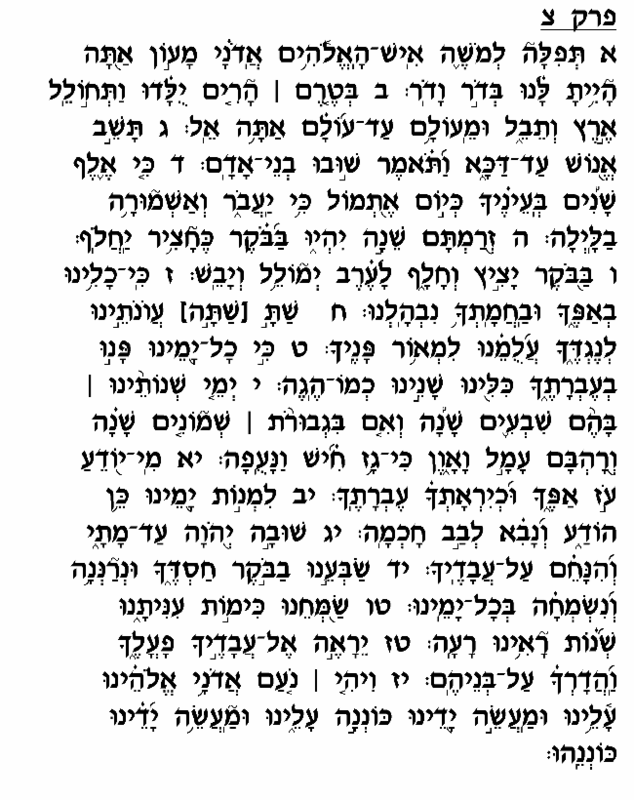 The opening words of this chapter, which we recite as part of the Shabbat and Yom Tov "Pesuke De'zimra "service, inform us that it was composed by none other than Moshe Rabbenu himself. Rashi comments that this Psalm begins a series of eleven chapters of Tehillim that Moshe had written and were later incorporated into the Book of Tehillim. In this chapter, Moshe presents a very sobering assessment of human life, particularly in contrast to the unparalleled greatness of God. God has existed even before the emergence of the earth (verse 2), whereas the human being must at times be made to suffer so that he will repent (verse 3). Moshe speaks not only of human frailty, but also of man's moral weaknesses, as a result of which he must live virtually his entire life in mortal fear of divine wrath (verses 7-11). The human being generally lives for only seventy or eighty years, the best of which – that is, the years of strength and vitality – are spent mainly in the stressful, agonizing process of earning a living (verse 10). Moshe concludes this otherwise disheartening Psalm with a hopeful prayer for God's comfort and assistance. He beseeches the Almighty to bless us all with abundant joy to compensate for the years of hardship and anguish (verse 15), and to bestow upon us His "pleasantness" that brings success and gratification in all our endeavors. Psalm 90 reflects the mindset that one should have as he approaches God in prayer – the humble recognition of man's frailty and inadequacy. A person cannot properly pray if he comes with the arrogant attitude of "I deserve it"; rather, like Moshe in this chapter, one must pray with a feeling of humility and unworthiness, recognizing his complete dependence on God for his very survival, which he cannot even claim to deserve due to his many failings and shortcomings.